The exhibition Louis Vuitton Marc Jacobs tells the stories of two men, Louis Vuitton and Marc Jacobs (artistic director of LV), and will highlight their contributions to the fashion world. An analysis rather than a retrospective, this parallel Vuitton-Jacobs comparison will provide new insight into the fashion system during its pivotal periods, beginning with its industrialisation and ending with its globalisation, focussing also on its artistic professions and crafts, technological advances, stylistic creations and artistic collaborations. 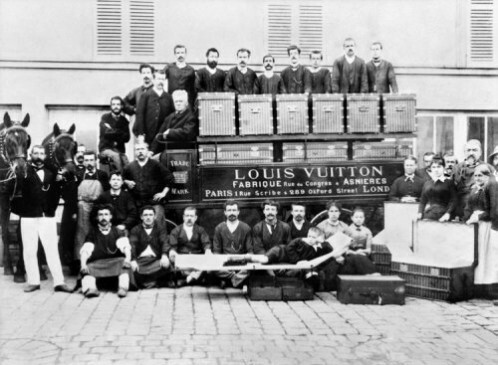 It will also be homecoming for Louis Vuitton, who set up shop only a stone’s throw from the Louvre, the home of his first great patron, Empress Eugénie. Over a century separates Louis Vuitton and Marc Jacobs, but both come together in the excellence of their creativity. But how did they succeed in taking the pulse of their respective periods to innovate and take an entire industry forward? And how did these two personalities, each with their own language, appropriate cultural phenomena and codes to write the history of contemporary fashion?